Springtime is rhubarb time! The sweet and sour stalks with their large leaves sprout as it were from nothing. Time for a rhubarb pudding! Dice the brioche or Zopf bread and the peeled rhubarb and mix. Beat the cream, sugar, eggs, cinnamon and vanilla sugar and mix with the rhubarb and bread. Pour into a buttered oven dish, sprinkle with almonds and bake in the preheated oven at 180°C for approx. 30 minutes until golden brown. Leave out to cool, sprinkle with powder sugar and serve – great with vanilla sauce or vanilla ice cream. 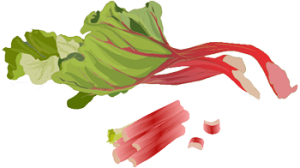 April is the month when the rhubarb stalks develop their deep red and fresh green colours and are ready to be harvested. But be sure to take hold of the rhubarb stalk at its base and lift it out by turning it clockwise. Never cut off with a knife.